A £1.2bn deal to build new UK trains has been won by Hitachi Rail Europe. Transport Secretary Patrick McLoughlin said: "This new order for class 800 series trains is part of the government's commitment to invest in our nation's infrastructure". The current East Coast mainline service uses Inter-City 225 sets, built in the late 1980s, which consist of a class 91 locomotive, a rake of nine Mark IV coaches, and a driving van trailer (DVT) at the other end. They were last refurbished between 2001 and 2006 by HSBC Rail, the then owners, so the interiors are around ten years old. Thursday's order is part of Britain's £5.8bn programme, launched in 2005, to replace the class 91's. 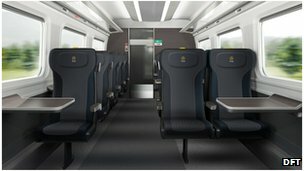 In total the new fleet will comprise 122 complete train sets and will have more seats and wider aisles than current models. The trains are capable of running at up to 140mph (225kmph), but to run at that speed lines and signals will need upgrading. Hitachi Rail Europe's chief executive Alistair Dormer said: "This order extends firm orders at the (Newton Aycliffe) factory until the end of the decade with significant capacity remaining available for further UK and export contracts actively being pursued."